The day started with light drizzle and heavy overcast and there was little prospect of any change, so I had given away any thought of going out birding. The phone rang. A voice from the past! Mike Newman was telling me of a possible Little Stint at Lauderdale, but as he was on his way to work, he couldn't stay. I had in fact had an e-mail from Priscilla Park in which she mentioned that "Bianca and Mat" (2 birders that I don't personally know) had seen a possible Little Stint there too. I haven't seen Mike for sometime--he now lives in NSW--but in the 70's and 80's, we spent a great deal of time birding together, not to mention cannon netting, in the halcyon days of the Tasmanian Shorebird Study Group, (now defunct). I somehow felt an obligation to go in search of this bird. In about 15 mi nutes I was at Lauderdale, the tide was going out fast, and the flock that Mike had described as being alongside the spit, was now spread out across a kilometre or so of mud. Despite the heavy overcast and drizzle, I set off across the mud, with, I must say, little expectation of even finding this bird. After about 10 minutes I actually found it, well at least what I presume was the bird in question. I managed a few shots from a considerable distance away (shown at top) and while intent on getting closer, I heard the unmistakable sound of an approaching helicopter. This was no run of the mill helicopter, this was a Bell 212 twin engined job, used during the Summer for firefighting. With its "thump thump" sound, reminiscient of the Iroquois of Vietnam fame, and flying at around 500 feet to remain visual under the overcast, it scattered the flocks of birds in all directions! The upshot was that I couldn't find the bird again, and with increasing drizzle, gave the chase away. Let me add that I'm not being critical of the helicopter operations. They have a job to do, and I suspect they were off to the SW National Park to look at the fires that have been burning there for 10 days or more. Back to the bird. Visually, in the murky conditions, I didn't come to any decision as to its ID, but after looking at the images, my belief is that it's a Red-necked Stint in breeding plumage. Although some others were showing signs of breeding plumage, this bird was much further advanced. Well I've published an image here so you can all have your two bobs worth. What's your verdict? From time to time readers send in their shots of birds, and 2 are shown here. I'm always glad to get feedback from readers, and like to see their work. As a general rule, at least for publication, I have a preference for images with a story, similar in style to those I normally publish, so don't be too put off if I don't publish material you send me. 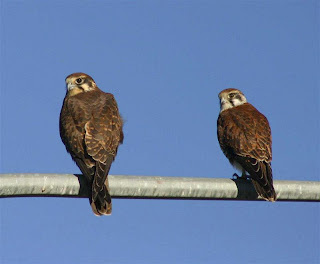 The images here are from Ron Spencer, showing a pair of Brown Falcons--fairly unusual to s ee the 2 together, the other is an Eastern Rosella photographed in the garden of Michael Dempsey at West Hobart. I have been threatening to write short articles on some aspects of digital photography, but as I don't see myself as an authority on the subject, I'm a little hesitant. However I'll offer the following thoughts. It is interesting to note that both the accompanying photos were taken on similar digital single lens reflex cameras (DSLRs), and both with telephoto lens of 300mm (if I read the 'hidden' information correctly). That is a good combination, and will enable you to get worthwhile shots. If you're going to take a lot of shots on any digital camera, you'll need a PC (or Mac), and a suitable editing programme. Picasa2 is a good one to start with, and it's a free download. I use it (I also have 2 other more sophisticated programmes) and do most of the image editing for the blog on it. While it's quite possible to get excellent results from compact cameras with a built in zoom lens, it's a whole lot easier with a DSLR, and a whole lot more expensive! I'll leave the subject there, but if there is sufficient interest, I'll consider writing in more depth. I will just add that at the moment, not only am I not able to easily read books, newspapers etc., post eye op. (successful), pending new glasses, but seem to have a bad case of RSI, something I never thought would happen to me! So I can't spend as much time as I would like on the computer. So if postings are a bit thin, that's my excuse. My thanks to Michael and Ron for their contributions. This is the time of year that we usually start to see the Double-banded Plovers. They've always been something of an oddity in my mind. Why would a species traverse the Tasman Sea to South East Australia, to spend the Winter in essentially the same sort of habitat and climate that they enjoy in their home country of New Zealand? Not only that, but only around half of them make the journey. A population estimated to be at least 12,450 birds, of which somewhat less than half Winter in Australia, and of that half, Tasmania appears to get the Lion's share. They can be found, usually in small flocks, on many of our sandy beaches, in the East, North and West. Unlike many of our migrant waders, they seem to prefer to roost in adjoining paddocks, rather than along the shores. Small flocks may also be encountered at inland sites. I have found them at several sites in the Midlands, such as Lake Dulverton at Oatlands and Township Lagoon at Tunbridge (and in surrounding paddocks). I have also seen them at the Great Lake and Lake Augusta (1000m+ level). By Spring they will have acquired the double bands across the breast, that give them their name, and make the return journey to breed. 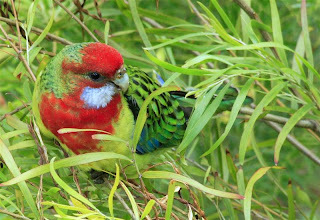 This bird was photographed at Pipeclay Lagoon earlier this week. One of a small number found with a flock of c.30 Red-capped Plovers. I recently found myself picking my way round pools of rainwater formed on either side of the unsealed road near the oyster sheds at Pipeclay Lagoon. The recent rainstorm had not only flooded this road, but made remedial work on the beach access from the sheds necessary. As I did so (I was in my car), I momentarily noticed an obvious bird of prey out of the corner of my eye. My first guess was a Swamp Harrier, as they are by far the most commonly seen bird of prey here, usually hunting over the roadside marsh. Not able to safely take my eye off the road, and in any event viewing the bird against the glare of the sun, I briefly lost sight of it. Second view it appeared dark, and obviously not flying like a harrier...maybe a Peregrine Falcon? They are occasionally seen here, and well worth further investigation. I drove on, doing a swift U-turn, my eyes partially on the road, and yet seeking a further view of this bird. By now it was some hundreds of metres away, but luckily it propped on a fence post and was being harrassed by a pair of Masked Lapwings. I drove slowly toward it, praying that it would stay long enough for a photograph. As I did, and by now the truth of its' ID had dawned on me, I watched it duck each time a Lapwing made a pass. I stopped some 40 metres away and took the accompanying shots, before it finally took flight. The bird, as you can see, is a juvenile Brown Falcon. Much darker than the adult birds that are more commonly seen. I suspect it was drawn here by the literally hundreds of White-fronted Chats feeding on the edges of the roadside pools. Perhaps a Brown Falcon is not quite as interesting as either of my first two guesses, but it did give me a 'photo opportunity' and a few moments of excitement as I speculated on its' identity. Still feeling the after effects of recent surgery, I decided I didn't want to undertake anything too strenuous and opted for a quiet early morning drive down towards the South Arm Peninsula. I knew the tide would be high and there was a fair chance of photographing the large flocks of Pied Oystercatcher roosting close to the road. In fact at Lauderdale, I quickly found a large group on the spit, but I also knew that approaching them would be pointless as they would take flight at my approach. I drove on to Pipeclay Lagoon. About an hour later, I returned to Lauderdale. By now, the tide was very hgh. Opposite the shops was a Pied Oystercatcher roost of, I guess, about 120 birds, forced close to the road by the height of the tide. I slowed, and as I did so, I realised that a solitary Eastern Curlew was standing on a submerged mound just off shore, and presented a good possibility for photography. Parking the car across the road, I approached the oystercatchers cautiously, afraid that they would fly and take the Curlew with them. They became very restless, but as you see I got my picture of the Curlew. It may all seem a bit melodromatic, but getting close to these magnificent birds isn't easy. Until this morning's episode, I don't think I've managed to get closer than about 3 or 4 hundred metres, so getting one close enough to photograph, was from my perspective, a triumph. It certainly capped off a great morning. The GTT has been run and won for 2006/7. After thinking that registering 5 teams would be a great result, we ended up with 13 teams and 43 participants. After publicity from the ABC and Mercury, we had enquiries from around the state, and eventually had teams from Grove, Westerway, Lauderdale and Hobart. The overall event was won by the "Rate of Knots" team (Lachie Clark, Mike Bysouth, Andrew Meyles and Cynthia Sleight Meyles), with 103 species. Second was "The Coot and More Hens" team, with 74, next was "The Mangling Magpies Muggers Monstersions", with 61, and then in order, "The Jenny-wrens", "The Couch-grass Graziers", "The Pied Finches", "The Northside Tattlers", "The Warriga Warblers" and " The Blue-wrens". The organizers team, "The White-fronted Chat-terboxes" (the Tongue Family) came in with a creditable 100 species, but had to be disqualified, due to a speeding ticket! Don and Sue Knowler won the "Armchair Twitchers" award , with 28 species from their home. The most raptors were seen by "The Two Charlies", with 5 on Bruny Island. "The Multicultural Tasmania" award, (most migratory waders) went to "Rate of Knots", with 4 species, and "Save Ralph's Bay " award to "The Pied Finches", with 12 species seen in and around Ralph's Bay. Other awards (really only certificates) were presented as well, at the follow up BBQ. Around $250 was raised for the "Save Ralph's Bay" cause, but more importantly, participants had lots of fun. This time of year many of our bush birds are in the process of moulting. Many of them look very 'daggy', and some present even more difficulty identifying them. As if seperating Flame Robins from their Scarlet cousins isn't difficult enough for many new birders, when in moult they can be even more of a challenge. The image at the bottom is a case in point. In fact it's a male Scarlet Robin (trust me!). It's not only in moult, but has recently bathed. The othe r images are of a female Scarlet Robin that came down to a pool that I was watching, and although I'm sure it was very aware of my presence, decided either that I was no threat, or the need to bathe was worth the risk. As I've mentioned in the past, I think that the birds are irritated by bits of th e sheath that the new feathers were encased in, and having a bath helps remove them. Also, as anyone who has handled wild birds knows, there are a range of insects that live in among the feathers, and bathing may remove some of them. Probably a bit of the truth in both those possibilities. Top bathers are Robins, Silvereyes, Black-headed, Strong-billed and Yellow-throated Honeyeaters, Brown Thornbills and Scrubwrens. I was sauntering back from the local shop this morning, having decided that the occasional light drizzle and heavy overcast didn't augur well for birding. As I neared my front gate, I heard several Masked Lapwing calling raucously. I turned to see the cause, and was surprised to see they were diving at a passing Swamp Harrier. This was a rare event in my suburb, in fact I can't recall the last time I'd seen one here. The upshot was that it tipped the scales in favour of going out. I decided on a visit to Five Mile Beach, close to Hobart Airport, part of the Seven Mile Beach Reserve. I have to say at this stage, that I have been visiting here for many years now and I don't recall it ever being in the run down state it is today. The car parking area had numerous beer cans strewn about, as well as other litter and evidence of regular hooning sessions. The children's play apparatus had the swings missing, and a notice announced that the toilet facilities were no longer there as they had been burnt down. The beach looked as if a rodeo had recently been run there, and there was evidence that mini bikes or similar, had run riot. This is an all too familiar scene in many of the reserves around Hobart. Leaving this depressing scene behind, I wandered over the mudflats, laid bare by a very low tide. I was hoping to get close enough to photograph the Eastern Curlew that I could see feeding there. In fact I could only get close enough to count them, about a kilometre, and even then they seemed very nervous. There were 26. 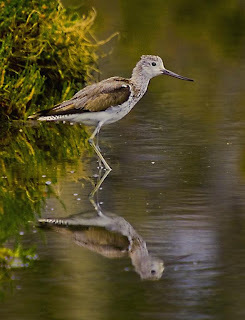 I turned and trudged back, disturbing two, previously unseen Greenshank, that had been feeding at the mouth of a small creek. I fully expected them to fly out to the tide line, but instead they sought refuge in the marsh. I could still see them, and decided that a close approach might just be possible. I used the shrubbery along the creek to mask my approach. I peered through a saltbush, but couldn't see them. Deciding that they'd flown, I wandered to the creek edge, only to realise that they were still there, but by now, rather nervous! A quick few shots of one of them, before they took flight, landing farther into the marsh. I decided that what I'd captured (the shots shown here) would have to do as I was reluctant to disturb them any more. 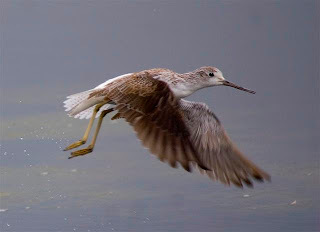 Greenshank are by no means uncommon, but this was the first time I had managed to photograph them. One of the delights of my recent visits to the Risdon Brook Park, are the many Welcome Swallows hawking along the shores and banks surrounding the dam. This popular reserve has a 4 kilometre track running around the perimeter and is in frequent use by walkers, joggers and bikers (and the odd birder!). Probably as a result of this, many of the birds are more easily approached. It also has the big plus of being barred to dogs. The outcome of that is that you're likely to encounter th e wildlife, and wallaby abound, but with luck you'll also encounter bandicoots and echidna, not to mention the sounds of many frogs in the shallower parts of the lake. I've taken several shots of birds in juxtaposition to notices over the years, those of Silver Gulls being by far the most numerous. They unwittingly stand atop notices saying "no standing" or similar, but this is my first showing a Welcome Swallow, albeit a juvenile. I must confess that I spent some time attempting to photograph the swallows in flight, but to no avail. A complete flop. But I was pleased to find and photograph a Tree Martin (centre shot)--my third recent attempt. A few pairs have nested in a large shed at the Northern end of the lake. Why they've chosen the shed in preference to the apparently suitable trees nearby, only they can say, but it did make photographing them easier.. The image at lower left is of an adult Welcome Swallow. I suspect this bird is in moult prior to migrating back to the Mainland, as it looks a bit shabby. These swallows, many of them this year's progeny, take up position on rocks along the shoreline, in between insect chasing forays. My overall impression is that, here at least, there are substantially less youngsters than last year. It is all too easy to put a 'human' interpretation on avian events, and I'm as guilty as anyone of occasional 'flights of fantasy' in that department. So my interpretation of what was going on, illustrated in the accompanying images, has to be seen in that light! While walking the spit at Marion Bay, I watched and photographed an adult plumaged Crested Tern carrying a small fish (I believe it's a Sand Whiting). I followed its' movements, assuming it intended to feed one of the several young Crested Terns present, a nd I prepared to photograph the event. However, what this tern actually did, was to fly from one group of adult Cresteds to the next, proffering the fish, apparently in the hope that one might accept it. It's the scene that is frequently seen prior to breeding. Rightly or wrongly, I think it was trying to find a mate. Whether this bird had just reached its 'majority' or lost it's previous mate, I've no idea, but sad to say, although I watched it for 20 minutes or so, it didn't find any takers. I wonder what was really going on? I spent the last few days at a family gathering up the East Coast, so I didn't do the usual amount of birding. But I did manage an hour at the Orford Spit on the way there, and these images are the result. So this blog is, unashamedly, about photos of Hooded Plover. That I was able to get much closer than usual to these birds, was largely as a result of a confrontation between a flock of about 7 plovers, all in adult plumage, except the juvenile shown in the bottom 2 shots, and the resident pair. The resident pair eventually drove the flock away, in this case toward me. They were reluctant to get too close to me, but the robust defence o f their territory by the residents, made them realise that getting close to me was the soft option! I was rather fortunate that the lighting wa s excellent, as from previous experience, photographing birds with black heads and light coloured bodies can be very tricky. While at the Orford Spit, I also noted what appeared to be the 2 remaining pairs of Fairy Tern, and at least one flying juvenile. Further up the coast at Little Swanport, there were around 28 Fairy Terns present in an area where they have previously bred. However, I couldn't determine whether they were in fact breeding there. One of the delights of the coastline around my suburb, on the Eastern Shore of the Derwent River, are the Sooty Oystercatchers. Although you're more likely to see them during the Winter months, a few venture up to the Tasman Bridge and beyond, almost anytime of the year. I recently watched and photographed a group of four, feeding among the rocks at low tide. I'm usually too intent on getting close enough to get reasonable images, to notice much else. But as I sat on the beach I realised that they were feeding on chitons. The chiton in question is chiton glaucus, a species apparently introduced from New Zealand, in the early 20th century, and now the commonest chiton found in the intertidal areas of South-East Tasmania. You'll probably recognise the mollusc from the image at right. What particularly fascinated me was their ability to deal so deftly with them. The "sooties" were picking them off the water washed rocks and bringing them up to a drier area. They then found a crevice to place them in, while they chiselled away the fle sh, again you can see this in the image at right. All over in no time. I tried to get even closer to one of them, but it took flight, but not without its 'prize', as you can see in the lower shot.